I loved JJ Abrams Star Trek reboot, but if there’s a bad scene in the movie’s Kirk’s rather lame chase sequence with an alien monster on an ice planet. It just doesn’t fit in with anything else that’s going on in the film and, maybe there’s a reason for that. Originally, they had something else in mind. Pretty great right? Infinitely superior to the somewhat lame, CGI monster Kirk encounters instead. 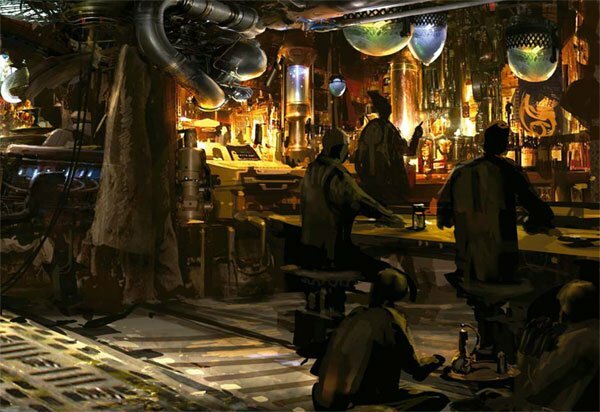 Imagine if he’d met Classic Spock in that bar, in a scene reminiscent of Obi Wan’s lightsaber wiedling rescue of Luke Skywalker! Instead we get a lame monster chase and a cave. Come on, this would have been so much better. The images come from a book being released on the 17th by Titan Books. It’s called “Images from Star Trek: The Art of the Film” and since it’s mainly focused on artwork it doesn’t offer an explanation for why they might have abandoned this infinitely superior concept for the ice world we got instead. Maybe it was budget, a bunch of snow and a CGI monster is probably cheaper than a complicated, Mos Eisley style set. Too, the movie already has one bar scene. We probably got a little taste of at least some of what they intended as part of the bar fight Jim Kirk gets himself into at the beginning of the movie.